March 31, 2015, 10:50 a.m. March 31, 2015, 10:50 a.m.
Well Dunn Insurance has gone hopping mad for charity – by donating 96 chocolate bunnies to Wood Street Mission. Staff from Well Dunn and its associated brand, Insurance Revolution, also donated Easter eggs of their own, bringing the grand chocolate total to 106. 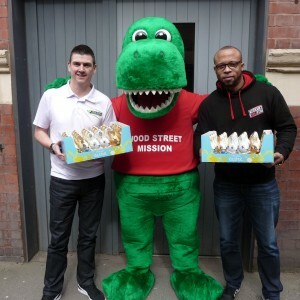 City centre-based Wood Street Mission (WSM) has been working to alleviate poverty in Manchester and Salford for nearly 150 years and each Easter the charity donates chocolate eggs and household food items to thousands of children in the area. Well Dunn Limited – Well Dunn and Insurance Revolution’s parent company – first became involved with WSM last Christmas, when every staff member donated their December bonus to the organisation. 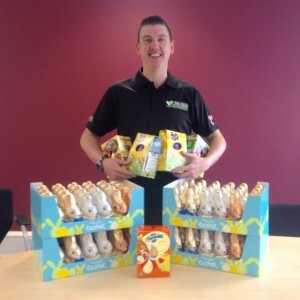 So following staff members’ act of generosity, company director, Paul Dunn, thought he would take the lead when it came to Well Dunn Limited’s Easter donation. Paul pledged that every new business sale Well Dunn and Insurance Revolution staff made, he would match it with a chocolate bunny, to be donated to WSM. And the sales teams took the challenge to heart, managing to sell an impress 96 new business policies between March 16 and March 20. 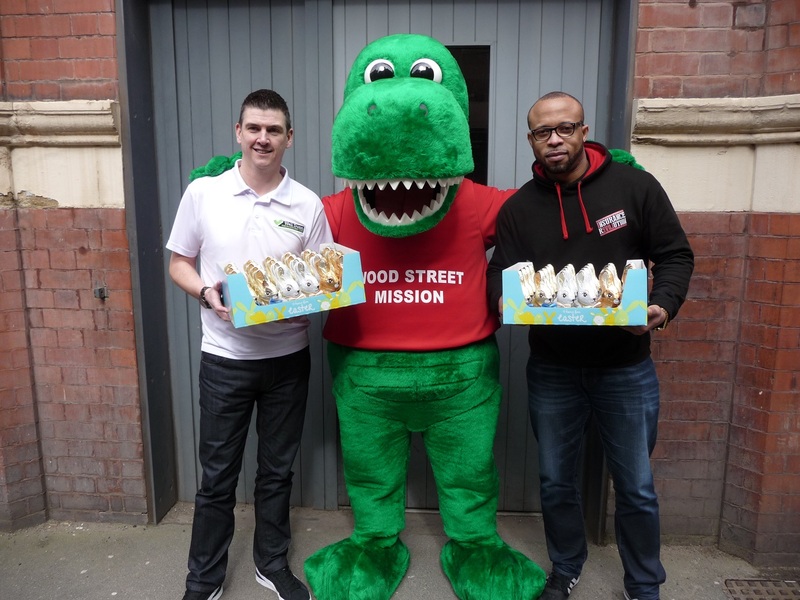 Paul Dunn, Paul Chambers; Well Dunn Insurance team leader and James Opera; Insurance Revolution insurance advisor, popped into Wood Street to drop off the donations – with Paul Chambers even dressing up as the charity’s mascot, Woody the dinosaur, for the occasion. Chief executive of Wood Street Mission, Roseanne Sweeney, said: “We are delighted to have the support of Well Dunn Insurance again for our Easter Appeal. Paul Dunn said: “We think Wood Street Mission does some amazing things for the local community so we are always more than happy to support them, however we can. Read more about Wood Street Mission here.